Over time, the term Wealth Management has come to be used interchangeably with that of Investment Management. Historically, Investment Management has been defined as the selection, appropriate allocation and continuous management of financial assets. A search for ‘Wealth Management’ will highlight many resources offering ‘Investment Management’; but few are representative of a comprehensive Wealth Management philosophy. At The Bulfinch Group, we believe Wealth Management should be far more than a well-designed investment selection and a discussion focused on rates of return. The Bulfinch Group has redefined Wealth Management by creating a Protection-First Planning Methodology to help safeguard wealth and provide for each client’s unique financial situation. Our Advisors utilize a client-centric approach, first preserving income and cash flow as the foundation of the wealth management process. 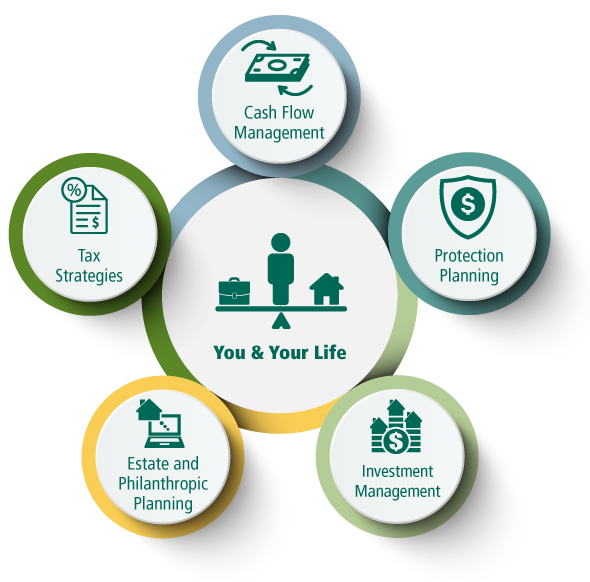 Investment management, estate planning, tax strategies, retirement planning, college savings, and ongoing cash flow protection are all additional components of the coordinated, integrated and cohesive wealth management methodology.